The fact that you probably know October is Breast Cancer Awareness Month is a sign of the campaign's overwhelming success. Seemingly every business goes pink, slapping ribbons and pink themes on everything from tasteless T-shirts to retired fighter jets, all in the name of "awareness." With more than 300,000 women expected to be diagnosed with breast cancer this year, there's no doubt that the campaign, which has prioritized early detection and treatment, has made huge strides. But you may also be aware that where there's a lot of money, there are people looking to turn a profit on your good intentions. While you may think you're helping out a good cause by purchasing a product stamped with a pink ribbon or donating your money to charity, it's not always clear where this money is going, or if it's helping those who need it most. Here's what you should know before writing that check or buying a pink "Freshly Squeezed" shirt. Companies that have jumped on the pink-ribbon train certainly understand the appeal of marketing their products under the guise of fighting breast cancer; it makes them look charitable, and can help drive sales. But there's another reason so many companies adopt the pink ribbon during October -- it's not regulated by the government or any trade agency. Which means you can use it for pretty much anything. Most products, though, fall into one of three categories: a percentage of sales will be donated to charity; the company producing the product donates a flat fee to charity, untethered to sales; or the company isn't giving anything to charity and is simply using your emotions to sell you something. In the first group, you have items like these headphones; 25% of proceeds benefit Bright Pink, an organization focused on breast and ovarian cancer prevention and education. The flat-fee method is a little bit trickier -- would a company actually wind up net positive by donating a smaller fee, then raking in higher profits from increased sales of pink products during October? It's not always easy to tell. KitchenAid, for example, pledges to donate $450,000 to Susan G. Komen in 2016 for its Cook for the Cure program, regardless of how many pink stand mixers or blenders they sell. Another variation of this practice places a cap on the amount of money a company will donate to charity: Reebok maxes out at $750,000 in donations to the Avon Foundation from sales of the Pink Ribbon line. If more items are sold, they're just like regular old Reebok products... on the other hand, the minimum donation of $300,000 guarantees a sizable chunk of money will go to a breast cancer charity, which may wind up as more than the products would've netted on their own. Sadly, a number of companies fall into the worst category: None of the proceeds go to charity, but the pink ribbon gets slapped on products in the name of awareness. These checks, for example, only help fight breast cancer if you make one out to a charity. This is why "awareness" is such a tricky word to use during October; literally anything could potentially improve awareness. 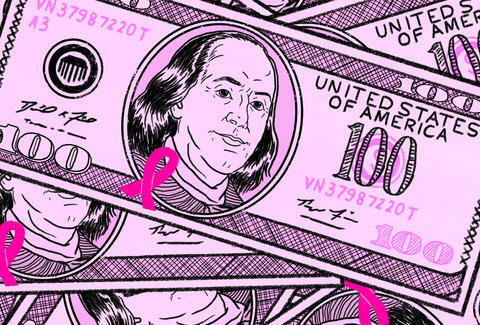 And even if a company does donate proceeds to charity, not every dollar makes it to breast cancer programs. The NFL -- not exactly known for its generosity -- has a well-publicized breast cancer awareness campaign, but only $11.25 of every $100 worth of pink merchandise sold makes it to the American Cancer Society; after covering ACS administration costs, only 8% goes to breast cancer research. The majority of the rest covers retail and merchandise costs. "Pinkwashing," a term coined by Breast Cancer Action, is the practice of claiming to support breast cancer awareness or research, usually through the sale of a pink-ribbon product, while also selling or promoting merchandise that might lead to the disease. Susan G. Komen, arguably the most well-known breast cancer charity, came under fire in 2013 and 2014 when it partnered with Baker Hughes, which distributed 1,000 pink drill bits to oil fields and donated $100,000 to the charity. The campaign tagline read, "Doing our bit for the cure," which makes you realize that 1) at LEAST two people thought this was a good idea and had to approve it, and 2) adding "for the cure" to the end of a phrase doesn't mean you're doing anything "for the cure." On top of the obvious absurdity of pink-tipped drill bits, Baker Hughes uses fracking, a technique that often leaves carcinogenic chemicals in the ground. Whoops. The two have since parted ways. In an email, a representative for Susan G. Komen said, "Baker Hughes made a flat donation to Komen, not tied to sales of the pink drill bits or any other product. Baker Hughes is no longer one of our corporate partners, but we appreciate the participation and commitment of the company and its employees." If you're worried about which of your products might fall into the pinkwashing category, you can keep track through the Think Before You Pink website. OK, so you want to support breast cancer research but don't want to deal with checking out every pink product you buy. Donating directly to charity seems like a foolproof way to make sure your money is going to a good cause, but that's not always the case. With a popular (and emotional) issue like breast cancer, the cause is saturated with charities -- and not all of them use their funds efficiently. The charity watchdog group Charity Watch currently monitors 10 breast cancer charities, and gives them letter grades based on things like overhead and fundraising -- basically, whether they're spending their donations on actual research and support. Susan G. Komen has a mediocre B- rating. The Breast Cancer Research Foundation is ranked the highest, with an A+, followed by the National Breast Cancer Coalition Fund (A) and the Breast Cancer Fund (A-). But just as many received poor ratings: the Breast Cancer Research and Support Fund, Breast Cancer Relief Foundation, United Breast Cancer Foundation, and Breast Cancer Charity of America all got Fs. Of the 10 monitored charities, that's 40% at an F rating; the Avon Foundation received a D grade, as did the American Breast Cancer Foundation. Cancer charities in general fare about the same; The American Cancer Society, which sounds legit and gets a lot of attention during breast cancer awareness month thanks in part to its partnership with the NFL, has a C rating. Ho-hum. Stephanie Kalivas, an analyst at Charity Watch, says this is common for charities that benefit certain causes; namely, ones that tug at your heartstrings. "I would say breast cancer, veterans, and any kind of children's cancer or sick children, those three tend to be kind of what we call 'emotional-giving charities,'" she explains. "They know somebody who has breast cancer, they feel terrible for sick children, nobody wants children to be sick. Then veterans of course is highly emotional, you want to support our veterans and people who are giving their lives for our country." And where some people see empathy, there are a few bad apples that see dollar signs in these emotional-giving charities. "Unfortunately, there are some bad actors out there in this industry that take advantage of that," she says. "They know that if you do direct mail or you do telemarketing and call people and say, 'Can't you just give $20 for breast cancer,' a lot of people just hear breast cancer and say, 'OK, I can spare $20.' They just give emotionally; they don't do any research they don't really find out what the $10 or $20 is going to go to." Bottom line: If you're going to give to a charity, at least take an extra five minutes to check its grade. Thirty years ago, a woman was pretty much forced to get a mastectomy to treat her breast cancer. Now, patients have the option to get lumpectomies, where only a portion of the breast is removed, and radiation, says oncologist Dr. Stephen C. Malamud, who's been treating breast cancer patients since the early '80s. So none of this is to say that you shouldn't give to breast cancer charities; you should just be smarter about it. If you choose to make a breast cancer ribbon purchase, Breast Cancer Action recommends asking four critical questions first. Does any money from this purchase go to support breast cancer programs? How much? Is there a "cap" on the amount the company will donate? Has this maximum donation already been met? Can you tell? If you're donating to a charity, make sure to check its rating with independent groups, and find out how it spends donations. If you're donating to a group known for lavish parties and fundraisers, you might want to take your money elsewhere. By being a more conscious consumer, you can help join the fight against breast cancer in a smart, productive way. You'll also avoid throwing your money away. No one likes throwing money away, right? Awareness is great. But being more aware of where your money is going, and who's actually benefitting from your purchase, is even better. Christina Stiehl is a Health and fitness staff writer for Thrillist. Follow her on Twitter @ChristinaStiehl.